I hate going to see films anymore in movie theaters, multiplexes, cineplexes, or whatever the hell they are called now. I just can’t see spending $12 (or $25 if you are foolish enough to buy soda and popcorn) to be crammed into a sterile-looking theater with a relatively small screen and have to deal with hordes of annoying teenagers who just won’t shut up. But I was persuaded, against my better judgment, to go see the third film in Christopher Nolan’s Batman trilogy, “The Dark Knight Rises.” I have to confess that I wasn’t overly smitten by Nolan’s busy, loud, overblown take on the Batman myth or Christian Bale’s deadly-dour version of Bruce Wayne (Where’s Michael Keaton when you need him?). But I was intrigued with the stories that I had been hearing about Tom Hardy’s portrayal of Bane, so I ventured forth from my own version of the Batcave to embrace the world of popular entertainment. First a quick review of the film: The story is basically a rehash of the Joker film with anarchists taking over Gotham/Manhattan instead of the Joker and his gang wreaking havoc on the city. Like Nolan’s previous films there are some wonderful special effects and some nice action sequences, but also plot holes the size of the Grand Canyon. The cast is all more than competent, although I am weary of Bale’s soulful Batman, Gary Oldman’s annoying method acting as Commissioner Gordon, and Morgan Freeman’s new spin on the righteous black man that he has played in every film that he has ever been in. Anne Hathaway is a completely pale and uninteresting “Catwoman” (Oh, for Julie Newmar! Purr!!!) and Michael Cain is wasted once again as Alfred. But Tom Hardy and Joseph Gordon-Levitt were both wonderful, as they are in every film they are in, and watching these two terrific actors on the big screen was definitely worth the price of admission. The bottom line about the film? To appreciate any of Nolan’s films—and this is true of “Inception” as well as his Batman movies—you’ve got to completely suspend disbelief, ignore plot inconsistencies, and simply go along for the cinematic ride. If you can do that, you’ll have a hoot watching “The Dark Knight Rises.” If you start asking too many questions like why the villains of the film, who seem rather self-interested, don’t just leave Gotham before the nuclear bomb that they have set goes off, or how Batman gets his broken back healed in just a few months, while festering in a third world prison, or how he gets from that prison, which is in the middle of nowhere, back to Gotham City in just a few days without any resources or friends to help him…if you start asking questions like these, you might as well just give up on the film. Now for the politics of the film. The plot seems simple enough: fanatical anarchists led by Bane take over Gotham and usher in their own version of the French Revolution. There’s been much debate, however, about what exactly Nolan is trying to say in this film about our contemporary political situation in the United States (if anything at all). The film is set in lower Manhattan and mostly around Wall Street—ground zero for the Occupy Wall Street movement. Commissioner Gordon has been responsible at the beginning of the film for initiating Gotham City’s own version of Bush’s Patriot Act, and it is clearly viewed as a good policy that has kept Gotham safe for the past eight years. Bane is a self-professed anarchist, and this is what the Occupiers were accused of being by the media and right-wing pundits. The city is “occupied” and “held hostage” by these anarchists. The very language that Bane uses about income inequality in particular is lifted right out of Occupy Wall Street. If the film doesn’t actually use the term, “The 1%,” (and I honestly can’t remember if it does or not) to describe the objects of Bane’s ire, there’s no doubt from the scenes of the elite being driven out of their “Park Avenue” apartments that this is who is being represented. Although the wealthy in the film are portrayed as being completely callous to the plight of those less well off, Nolan’s film treats the rich who are forced to experience “wealth distribution” as the ultimate victims in the film. Batman is seen as the only one who can right the wrongs that they have experienced and give them back all their ill-gotten wealth. In the end the city is saved by a millionaire who hasn’t worked in years, lives in a big mansion with a butler, and has more toys and gadgets than he can ever use in his lifetime. Even after Bruce Wayne loses Wayne Manor, he still apparently has more than enough money to live high off the hog with his latest fling, Selina Kyle, in France. Apparently, even in bankruptcy, the rich live by a different set of rules than you and I do! On the other hand, whether he realizes it or not, with “The Dark Knight Rises,” Nolan has done a great service to the Occupy Wall Street movement, by keeping it alive when it is all but moribund. 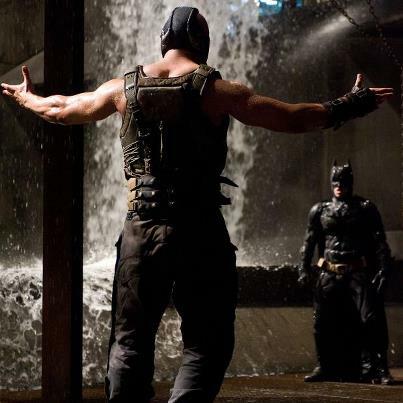 Despite its reactionary tone, the film also revives the always important topic of income inequality—the issue in the film which seems to motivate Bane. And here’s the ultimate kicker: more than a few people who I have spoken to have said that they found the character of Bane as portrayed in the film to be strangely compelling. One went so far as to say that he almost was hoping that Bane would defeat Batman. Bane is a violent, sociopathic thug, who is willing to commit the mass murder of millions of people, and audience loves him! What could possibly account for this strange phenomenon? My explanation is that the audience digs Bane because he believes in SOMETHING, because he clearly demonstrates passion and commitment, and because he is able, through his example and his lofty rhetoric, to inspire his supporters to follow his vision for Gotham City. All this actually is what a leader does. And perhaps the audience simply appreciates the fact that Bane has any values at all in a world where our own political and economic elites seem to value only the perpetuation of their own power and wealth. Turning a self-professed anarchist into the true hero of “The Dark Knight Rises” was a really neat trick—especially when that character was supposed to be the villain of the film. Nolan is also producing the new Superman reboot that is coming out next year. If he can just turn Lex Luther into a contemporary version of Leon Trotsky and have General Zod spout some nifty Leninist doctrine, who knows, the Marxist International might come sooner than any of us could possibly imagine.